"What's this? A Ranger, caught off his guard?" If you're a fan of Lord of the Rings then you'll take great pride in dressing up like the elegant elf queen Arwen. Embody the grace of the noblest of elven maidens in this officially Licensed Lord of the Rings, Queen Arwen costume set. Features a light green floor length dress with a lace trimmed neckline; lace long sleeves with long flowy draped sleeve ends; silver royal tiara completes this ethereal outfit. Includes dress and tiara. 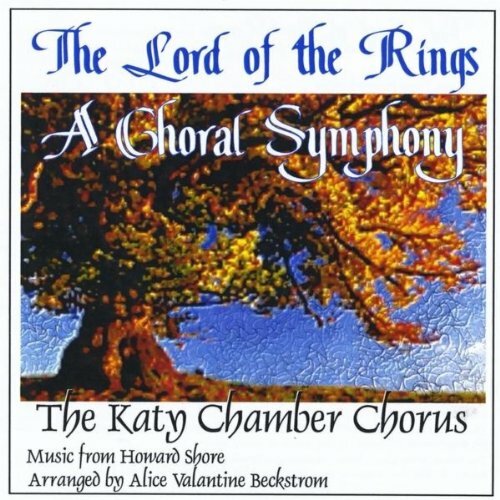 Pair with other officially licensed Lord of the Rings costumes by Rubie's for group dress up fun. Includes dress and tiara. Rubie's Costume Company has been bringing costumes and accessories to the world since 1950. As the world's leader, we take our mission seriously to make dressing up fun! Mascots, rental quality costumes, masks, wigs, accessories, shoes, and every significant licensed costume you want to wear can be found under the Rubie's brand. Still family owned and still family focused, Rubie's brings you fun for every season: Halloween, Christmas, Mardi Gras, Easter, and every occasion in-between. 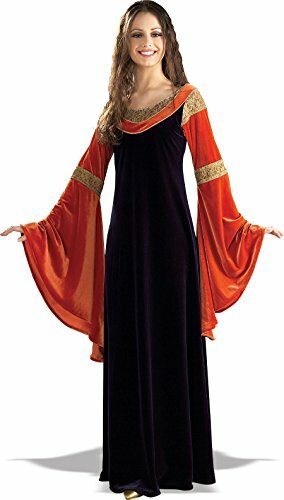 Get into character in this Officially Licensed Deluxe Queen Arwen black dress with burnt orange bell sleeves and gold lace trim. Women's standard size designed to fit dress size 9 to 13. Look for Rubie's Lord of the Rings and Hobbit weapons, wigs, cloak pin, Elven ears - everything you need to complete your look. LOOK FOR COORDINATING officially licensed Lord of the Rings costumes by Rubie's for group dress up fun. 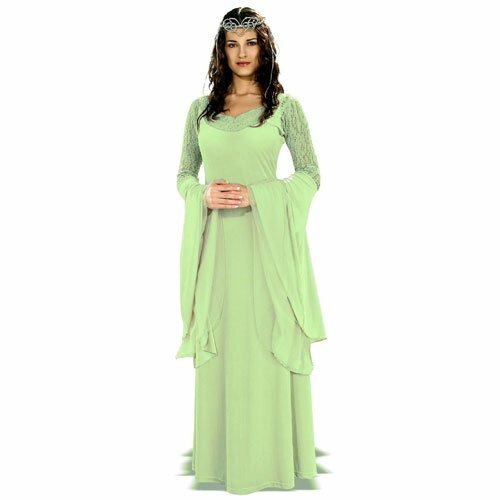 This deluxe Arwen costume includes a tiara and a pale sage dress with long bell sleeves and lace details. Arwen's dress is made from a pane velvet fabric with a low sheen. This Deluxe Queen Arwen comes in adult size Standard. 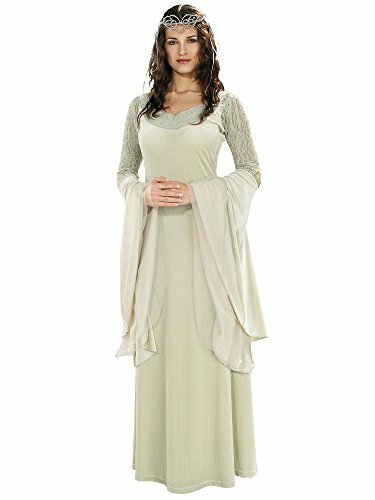 This Deluxe Queen Arwen is an officially licensed Lord of the Rings costume. Evenstar necklace is sold separately. 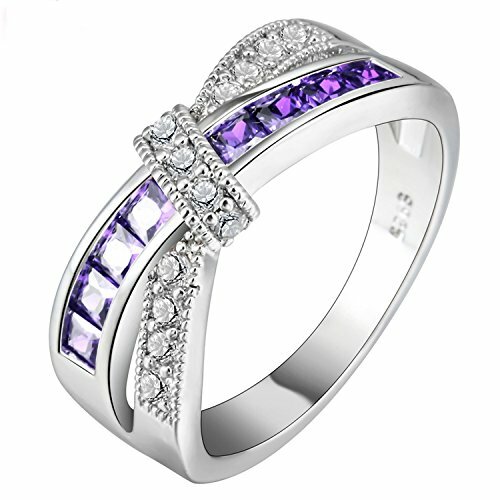 Look just like Arwen, the beautiful elf from the blockbuster movie, The Lord Of The Rings! 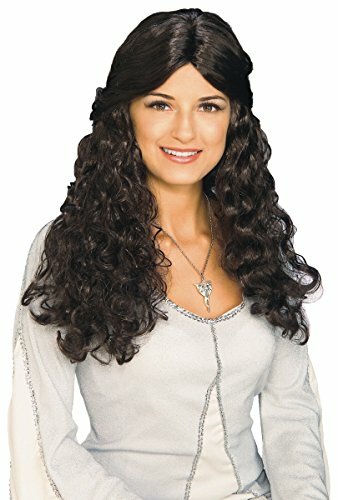 Long black wavy wig. One size. 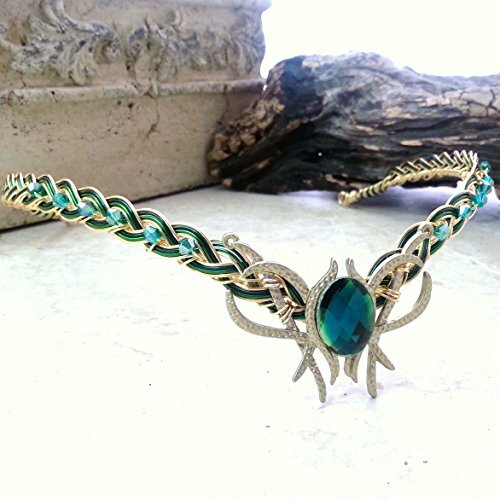 An elegant celtic weave circlet with a unique focal. Evenstar (Undómiel in the Elvish tongue) was the name given to Arwen by her grandmother Galadriel..a prophetic name, for she was indeed the Evening Star of her people. The back of this piece is open, designed to be tied together with long flowing ribbons, or just simply pinned here and there. This allows it to work well with many different hairstyles and updos. Our wire is nickel free and has a non-tarnish coat that keeps it shiny and makes it easy to wear even for allergy sufferers. BUTTERFLY BACK OPTION: For just $15 extra you can finish off the back of your circlet in style. (picture 5) All our circlets are open-backed allowing you to share them or do a different hairstyle. The Butterfly back is simply looped into whatever you tie the circlet with, ribbon, cord, leather, elastic etc, making a great final touch to your headpiece. A magical teal green gem focal is the centerpiece of this stunning circlet, with a Celtic weave base sparkled up with crystals. 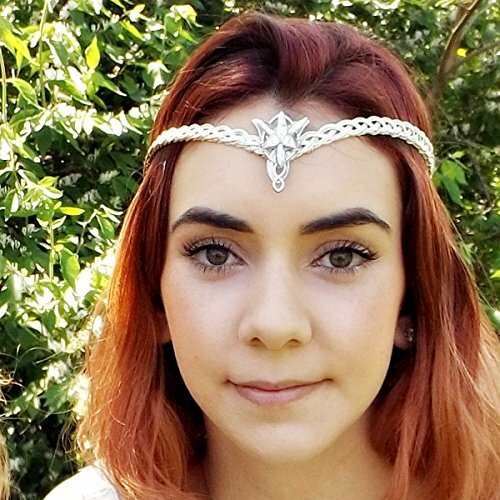 Available with gold or silver wire/metals This piece can be worn down on the forehead like a traditional elven circlet, OR turned upside down and worn in tiara crown style. The back of this piece is open, designed to be tied together with long flowing ribbons, or just simply pinned here and there. This allows it to work well with many different hairstyles and updos. Our wire is nickel free and has a non-tarnish coat that keeps it shiny and makes it easy to wear even for allergy sufferers. BUTTERFLY BACK OPTION: For just $15 extra you can finish off the back of your circlet in style. (picture 5) All our circlets are open-backed allowing you to share them or do a different hairstyle. The Butterfly back is simply looped into whatever you tie the circlet with, ribbon, cord, leather, elastic etc, making a great final touch to your headpiece. NOTE: Butterfly and front focal piece metal will match your wire color choice...gold is a MATTE gold while the silver pieces are CHROME (shiny) metallic.